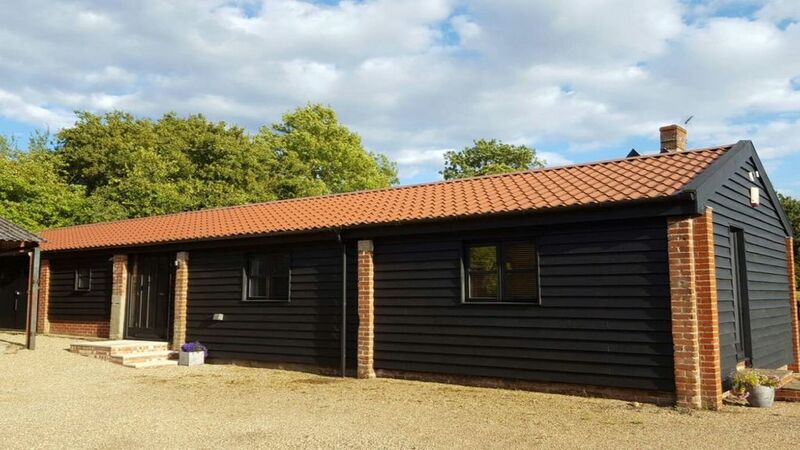 Our barn is close to the beautiful Suffolk Coast, including Southwold, Walberswick, Aldeburgh, Dunwich and the popular nature reserve at Minsmere. You’ll love our barn because of the views of open countryside and the beautiful rural location. The barn is good for couples, solo adventurers, and families (with kids). We have a lovely play area with swings, slide and little play house, lots of books for young and old and a selection of board games. Bush Hill Barn is a modern barn conversion that used to be a milking shed. With underfloor heating throughout, the barn is a warm and cosy place to stay, but benefits from being light and airy too, with lovely high ceilings. The barn is all on one level, but there are steps to get in. You will find a large living/dining area, large bathroom, kitchen and two bedrooms. One double and one twin. There is a sofa bed available in the main living area, but this would need to be put away during the day to make the main room useable. We also have a travel cot (please bring your own preferred bedding for this) and high chair available on request. You will have the whole barn to yourselves! The barn has a side door that leads out onto your terrace and a fenced in area that includes a climbing frame and little play house. You can also use the trampoline and badminton area, just bring your own shuttlecocks. The badminton area will not be available in the winter months or if the ground is very wet and muddy.Our house is next door and we will be available to you most of the time to answer questions you may have.We do have a bouncy Golden Retriever who would love to say hello! But we can keep him away if you would like us to. We have lived in Bush Hill Farm for over 20 years and have always loved the peace, tranquility and beauty of such a lovely location. We are lucky enough to be a short drive from some of the countries most picturesque locations, but always appreciate coming home to our little bit of paradise. We loved this property from the first moment we saw it! The large bathroom has underfloor heating and a heated towel radiator. Bath and hand towels are provided as well as shampoo, conditioner and body wash. There is underfloor heating throughout the barn. A washing machine is available on request but is in the main house and not in the barn itself. Outside and undercover parking in our barn is available. We don't have a locked garage, but there is an open barn you can put your car in. A cafetière and ground coffee are provided. We do provide a few things to make the start of your stay easier. Tea, bags, coffee, salt, pepper and olive oil are always available. Both adults and children's books are available. Several toys for young children are in the barn and there is an outdoor play area including a trampoline too. Outdoor furniture, an umbrella and a picnic table are provided. We are very close to the beautiful Suffolk coast and the nature reserve at Minsmere. We are well placed to explore Southwold, Aldeburgh, Dunwich and the market towns of Beccles and Bungay.